Healthy People 2010 users provided feedback about the barriers they experienced to implementing the initiative within their organization/agency. Barriers were classified as being related to the Healthy People initiative or being related to the respondent’s organization/agency. Overall, respondents were less likely to select barriers related to the initiative, as compared to barriers related to their organization/agency. In fact, barriers imposed by the initiative itself were selected by less than 45 percent of any sample type. When looking at barriers related to the Healthy People initiative, the most commonly reported barrier was the lack of data to track objectives (32 percent), followed by too much material (22 percent) and a lack of guidance on how to implement (21 percent). However, the percent of users indicating too much material, and a lack of guidance on how to implement as barriers to use has statistically significantly decreased since 2005. Exhibit 18 illustrates how each respondent type reported each of these three barriers. Exhibit 18 is a bar chart showing the percent of HP Coordinators, Chronic Disease Directors, MTAHB, Tribal Health Organizations, and Local Health Organizations that consider lack of guidance, no data, and/or too much material, a barrier to using Healthy People 2010 more (among users of Healthy People 2010). When examining barriers related to the respondents’ organization/agency overall, insufficient resources was the barrier cited most frequently (76 percent), followed by competing priorities (65 percent) and lack of buy-in from primary decision makers (30 percent). The two leading barriers (insufficient resources and competing priorities) have decreasesd significantly since the 2005 User Assessment. Exhibit 19 illustrates the percentage for each barrier, by respondent type. The exhibit also shows that these barriers did not vary greatly among respondent types. Exhibit 19 is a bar charting showing the percent of HP Coordinators, Chronic Disease Directors, MTAHB, Tribal Health Organizations, and Local Health Organizations that consider insufficient resources, lack of buy-in, and/or competing priorities a barrier to using Healthy People 2010 more (among Healthy People 2010 users). In general, an organization/agency’s size did not correlate with barriers to use. This was true for barriers related to the Healthy People initiative and for barriers related to the respondents’ organization/agency. However, “lack of guidance on how to implement” was a significantly stronger barrier of use for small organization/agencies than large organizations/agencies. Thirty-two percent of small organization/agencies using Healthy People 2010 indicated that lack of implementation guidance was a barrier to using the initiative more, while only 16 percent of large organizations/agencies cited this as a barrier. Healthy People 2010 users identified different types of technical assistance (TA) that they believed might improve the organization/agency’s ability to further implement the initiative (Exhibit 20). When asked to select specific areas where technical assistance is needed, respondents were most likely to request technical assistance in providing examples of programs demonstrating progress towards Healthy People 2010’s goals, followed by examples of how other states and/or organizations/agencies use Healthy People, and how they translate Healthy People into action. MTAHB were most also likely to request guidance on collecting data to track progress toward achieving Healthy People objectives. MTAHB and Ttribal health organizations also stated they would benefit from assistance with translating Healthy People 2010 into action, and from HHS identifying individuals who can provide assistance..
Respondents were also given the opportunity to comment in a “free-text” field of the survey about other ways HHS could help users progress toward reaching the Healthy People 2010 goals. Providing increased funding led the list of suggestions in this area. Respondents specifically cited the need for funding of evidence-based interventions. Additionally, respondents reported a need for more “user friendly” materials and more technical assistance. 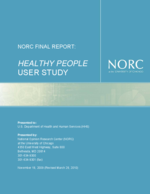 Many also suggested that HHS provide examples of success stories of Healthy People 2010 use.